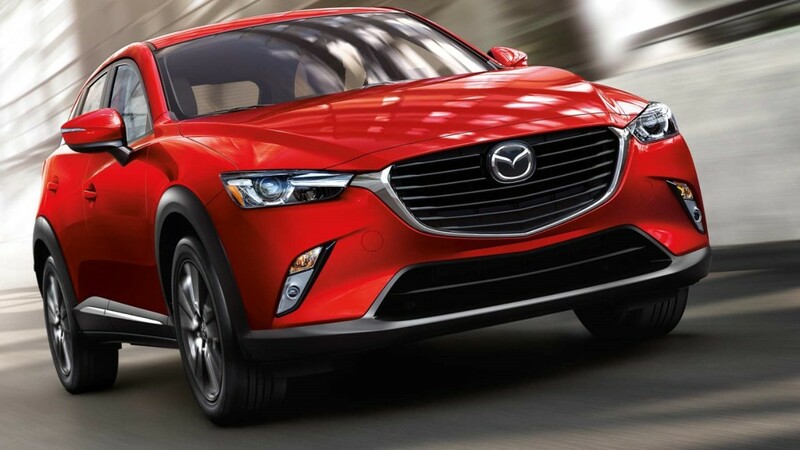 Island Mazda near Jackson Heights, New Jersey introduces the new 2017 Mazda CX-3 Subcompact SUV. The CX-3 is a fun and feisty runabout with a can-do attitude, offering taut handling paired with edgy styling. A 146-hp 2.0-liter four-cylinder and a six-speed automatic with front-wheel drive provide the zoom-zoom; all-wheel drive is optional. The CX-3 relies on its sport-tuned suspension and creative weight-saving measures to maintain Mazda’s unique brand of pleasure. The cabin is equally well designed, featuring high-quality materials and modern driving aids. Eager to capitalize on an expanding trend, Mazda added a third crossover to its lineup for 2016 called the CX-3. Smaller than the compact CX-5 and the three-row CX-9, this newest entry has a name that might suggest that it’s a high-riding version of the Mazda 3 compact. The CX-3 is more closely related to the subcompact Mazda 2 hatchback. In fact, it has become the de facto replacement for the 2 in the United States, as Mazda’s smallest hatch is no longer sold here, due to the CX-3’s greater potential for sales and profitability. Plastic body cladding and optional all-wheel drive are meant to lure SUV-leaning buyers, but the CX-3’s carlike driving experience and sharp interior design are the elements that helped it earn a comparison-test victory against other small crossovers, including the Jeep Renegade and Honda HR-V.
For its second model year, the 2017 CX-3 benefits from just a few minor trim and equipment changes. There’s been some fancy-wheel democratization, as the mid-level Touring trim now receives the snazzy 18-inch wheels that were previously included with only the top Grand Touring model. Active safety technology became a bit more accessible, too, as Mazda dropped the cost of the i-Activsense package offered on the Grand Touring (adaptive cruise control, lane-departure warning, automated emergency braking, and more). Stop by Island Mazda near Jackson Heights, New Jersey today and check out the all-new 2017 Mazda CX-3 and take it for a test drive today!